You are here: Home » News » Product News » Which is a better steel or fiberglass garage door? 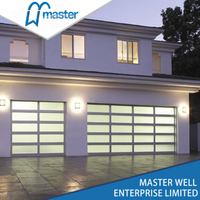 According to the different demands of customers, there are many choices when choosing a garage door, such as roller shutter garage door, sectional garage door. Comparatively speaking, sectional garage door is more European effect and gorgeous. As for sectional overhead garage door, they are consist of steel PU foaming garage door, iron sectional garage door, wooden sectional overhead garage door as well as aluminum glass garage door. 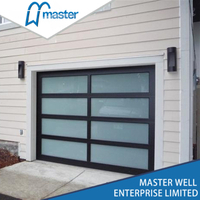 However, as a new type of sectional overhead garage door, glass overhead garage door is become more and more popular. Today, we will talk about one of aluminum glass garage door to illustrate aluminum garage door is better than steel garage door, for example, aluminum alloy hollow glass garage door. 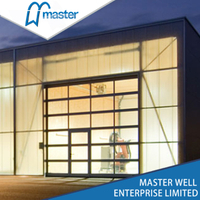 As we all know, the biggest feature of steel insulation garage door is thermal insulation and heating preservation. 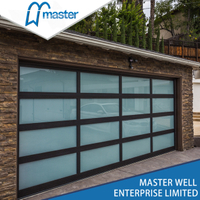 For the double layer hollow glass garage door, it’s made of 4mm+4mm hollow glass with pumping vacuum inside, which is available to achieve the effect of heating insulation, noise insulation also. 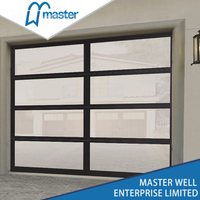 Comparing to steel garage door, the aluminum garage door with hollow glass is much better on the light transmission. That’s widely used in commercial shops, 4S shops, hotel and high-end villas, more beautiful. If you think the privacy is not good as steel garage door, it’s possible to past a sunscreen film on the glass. Moreover, the double hollow glass has a good performance of preventing the radiant heat and reducing the dizziness caused by the evening sun. As a beautiful glass garage door, the color of aluminum profile can be painted by the customers’ need, white, black, brown, bronze, yellow, red or green etc., any color you like. For the surface finishes, we have two types: anodized and powder coating. 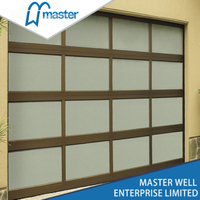 With frosted glass, the aluminum door will be more gorgeous and fashionable. 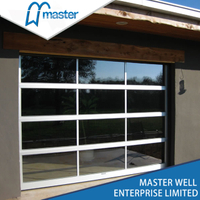 For glass sectional overhead door, it’s easy to open a small passing door as a personal access, practical and safe. For the aluminum garage door with glass, it’s much heavier than steel garage doors. So the safety is more important, but easy to realize. With photo sensors, the glass door will be stopped immediately if there is any people or things passing during the opening/closing. Moreover, the motor has the function of self-blocking. During the operation of closing, if there is any obstacle blocked, the door will rebound, to make sure the safety. 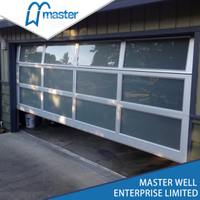 It’s easy for user to maintain the glass garage door. When it’s dirty on surface, wash and dry it. That’s so easy. Besides, the hardware accessories are relatively flexible, hard-wearing and anti-rusting. How to Choose Steel Sectional Garage Door or Aluminum Glass Sectional Garage Door? In summary, the aluminum glass door is better relatively. 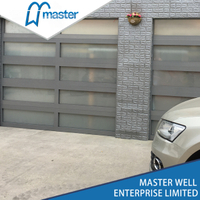 Including the thermal insulation or aesthetics, the aluminum glass garage door also has more and more characteristics like perspective, beauty, safety, E-Maintenance, which is more suitable for a nice house or shop or warehouse. If you need the sectional garage door with high strength, heat insulation, noise insulation and good tightness, as well as better perspective and more daylight, it’s better to choose the aluminum sectional glass overhead garage doors.